While Android has received a number of security enhancements in the last few releases, the lockscreen (also know as the keyguard) and password storage have remained virtually unchanged since the 2.x days, save for adding multi-user support. Android M is finally changing this with official support for fingerprint authentication. While the code related to biometric support is currently unavailable, some of the new code responsible for password storage and user authentication is partially available in AOSP's master branch. 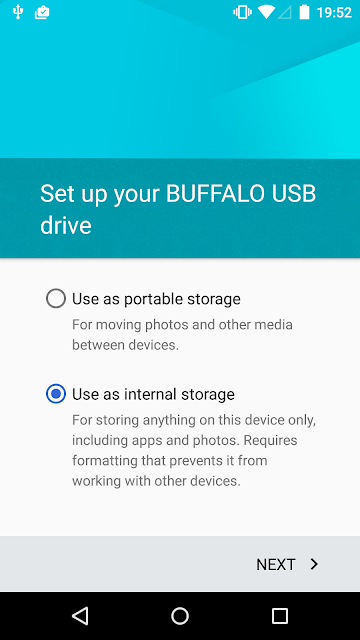 Examining the runtime behaviour and files used by the current Android M preview reveals that some password storage changes have already been deployed. 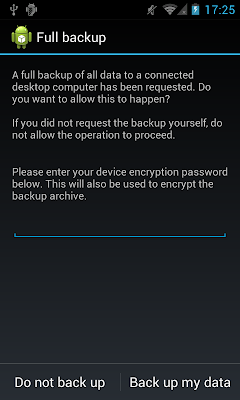 This post will briefly review how password storage has been implemented in pre-M Android versions, and then introduce the changes brought about by Android M.
Stock Android provides three keyguard unlock methods: pattern, PIN and password (Face Unlock has been rebranded to 'Trusted face' and moved to the proprietary Smart Lock extension, part of Google Play Services). The pattern unlock is the original Android unlock method, while PIN and password (which are essentially equivalent under the hood) were added in version 2.2. The following sections will discuss how credentials are registered, stored and verified for the pattern and PIN/password unlock methods. Android's pattern unlock is entered by joining at least four points on a 3×3 matrix (some custom ROMs allow a bigger matrix). 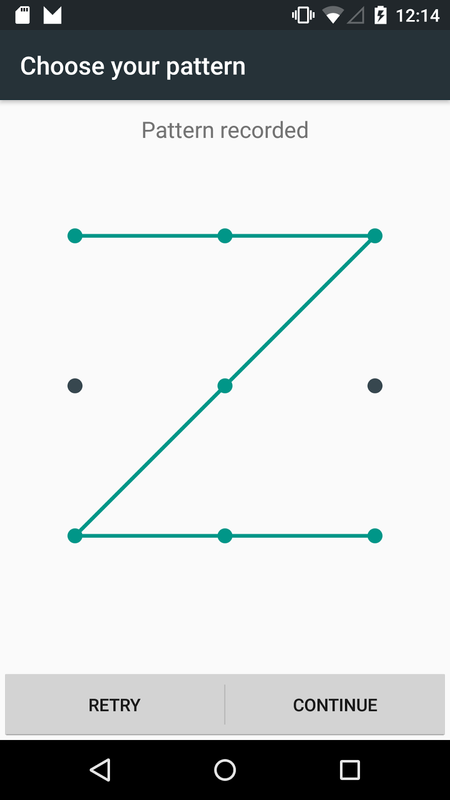 Each point can be used only once (crossed points are disregarded) and the maximum number of points is nine. The pattern is internally converted to a byte sequence, with each point represented by its index, where 0 is top left and 8 is bottom right. Thus the pattern is similar to a PIN with a minimum of four and maximum of nine digits which uses only nine distinct digits (0 to 8). However, because points cannot be repeated, the number of variations in an unlock pattern is considerably lower compared to those of a nine-digit PIN. As pattern unlock is the original and initially sole unlock method supported by Android, a fair amount of research has been done about it's (in)security. It has been shown that patterns can be guessed quite reliably using the so called smudge attack, and that the total number of possible combinations is less than 400 thousand, with only 1624 combinations for 4-dot (the default) patterns. Android stores an unsalted SHA-1 hash of the unlock pattern in /data/system/gesture.key or /data/system/users/<user ID>/gesture.key on multi-user devices. 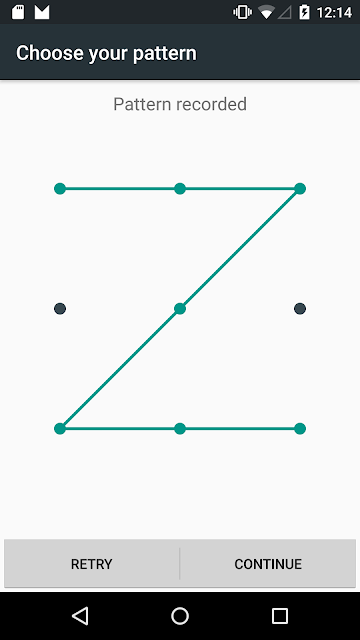 It may look like this for the 'Z' pattern shown in the screenshot above. Because the hash is unsalted, it is easy to precompute the hashes of all possible combinations and recover the original pattern instantaneously. As the number of combinations is fairly small, no special indexing or file format optimizations are required for the hash table, and the grep and xxd commands are all you need to recover the pattern once you have the gesture.key file. <active-password length="6" letters="0" lowercase="0" nonletter="6"
If you were able to obtain the password.key file, chances are that you would also have the device_policies.xml file. This file gives you enough information to narrow down the search space considerably when recovering the password by specifying a mask or password rules. For example, we can easily recover the following 6-digit pin using John the Ripper (JtR) in about a second by specifying the ?d?d?d?d?d?d mask and using the 'dynamic' MD5 hash format (hashcat has a dedicated Android PIN hash mode), as shown below . An 8-character (?l?l?l?l?l?l?l?l), lower case only password takes a couple of hours on the same hardware. 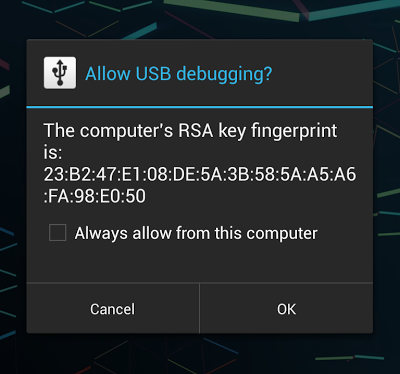 Android's lockscreen password can be easily reset by simply deleting the gesture.key and password.key files, so you might be wondering what is the point in trying to bruteforce it. As discussed in previous posts, the lockscreen password is used to derive keys that protect the keystore (if not hardware-backed), VPN profile passwords, backups, as well as the disk encryption key, so it might be valuable if trying to extract data from any of these services. And of course, the chance that a particular user is using the same pattern, PIN or password on all of their devices is quite high. Here secure_id_t is randomly generated, 64-bit secure user ID, which is persisted in the /data/misc/gatekeeper directory in a file named after the user's Android user ID (*not* Linux UID; 0 for the primary user). The signature format is left to the implementation, but AOSP's commit log reveals that it is most probably scrypt for the current default implementation. Other gatekeeper implementations might opt to use a hardware-protected symmetric or asymmetric key to produce a 'real' signature (or HMAC). Neither the HAL, nor the currently available AOSP source code specifies where password handles are to be stored, but looking through the /data/system directory reveals the following files, one of which happens to be the same size as the password_handle_t structure. This implies that it likely contains a serialized password_handle_t instance. The program output above leads us to believe that the 'signature' stored in the password handle file is indeed the scrypt value of the blob's version, the 64-bit secure user ID, and the blob's flags field, concatenated with the plaintext pattern value. The scrypt hash value is calculated using the stored 64-bit salt and the scrypt parameters N=16384, r=8, p=1. Password handles for PINs or passwords are calculated in the same way, using the PIN/password string value as input. With this new hashing scheme patterns and passwords are treated in the same way, and thus patterns are no longer easier to bruteforce. That said, with the help of the device_policies.xml file which gives us the length of the pattern and a pre-computed pattern table, one can drastically reduce the number of patterns to try, as most users are likely to use 4-6 step patterns (about 35,000 total combinations) . Because Androd M's password hashing scheme doesn't directly use the plaintext password when calculating the scrypt value, optimized password recovery tools such as hashcat or JtR cannot be used directly to evaluate bruteforce cost. It is however fairly easy to build our own tool in order to check how a simple PIN holds against a brute force attack, assuming both the device_policies.xml and gatekeeper.password.key files have been obtained. As can be seen below, a simple Python script that tries all PINs from 0000 to 9999 in order takes about 10 minutes, when run on the same hardware as our previous JtR example (a 6-digit PIN would take about 17 hours with the same program). 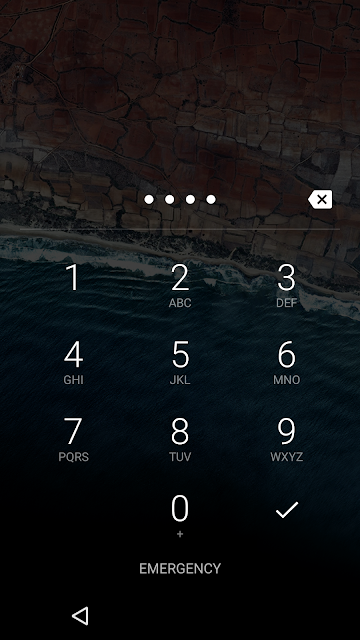 Compare this to less than a second for bruteforcing a 6-digit PIN for Android 5.1 (and earlier), and it is pretty obvious that the new hashing scheme Android M introduces greatly improves password storage security, even for simple PINs. Of course, as we mentioned earlier, the gatekeeper daemon is part of Android's HAL, so vendors are free to employ even more (or less...) secure gatekeeper implementations. This returns a Binder Parcel with the primary user's (user ID 0) secure user ID, which matches the value stored in /data/misc/gatekeeper/0 shown below (stored in network byte order). Android M introduces a new system service -- gatekeeper, which is responsible for converting plain text passwords to opaque binary blobs (called password handles) which can be safely stored on disk. The gatekeeper is part of Android's HAL, so it can be modified to take advantage of the device's native security features, such as secure storage or TEE, without modifying the core platform. The default implementation shipped with the current Android M preview release uses scrypt to hash unlock patterns, PINs or passwords, and provides much better protection against bruteforceing than the previously used single-round MD5 and SHA-1 hashes. Are you aware of any hardware backed lock screen implementations with TrustZone that enforce a delay between authentication attempts? For example, on iOS, SecureEnclave forces a 5 second delay between authentication attempts. It's not very clear whether HAL provides this. But I get following error when executing the script. Could you please let me know what is the library you imported scrypt. Better if you can share the whole script. Also note that this is not going to work on the Nexus 5X/6P, as they do password encryption in TrustZone. Have you tried using 'adb pull` to copy the file to your computer? SyntaxError: invalid syntax. I am trying to see if I can recover a PIN. Could you send me a copy of your script, maybe I am missing something? I currently have a Android marshmallow device. I have been able to aqcuire the handset physically and for the sake of learning I want to recover the passcode (4 Digit). The script you mention at the line "As can be seen below, a simple Python script that tries all PINs from 0000 to 9999 in order takes about 10 minutes"
devices is nexus5 android6.0;key have 58 byte;Is this method available?